St. Vincent de Paul Parish in Richboro, where Archbishop Charles Chaput celebrated the parish’s 50th anniversary Mass on April 22, received its name in an interesting fashion, according to long-standing lore. When the matter of a new parish in Richboro in rapidly growing Central Bucks County was under discussion by the Archdiocesan Consultors a half-century ago, one of the committee members suggested that given the name of the community, the parish should be named for a patron saint of the poor. Cardinal John Krol thought it was a great idea and the new parish was placed under the patronage of St. Vincent de Paul, the saint of charitable societies and works. As a parish it has worked really hard ever since to live up to the ideals of its patron. When it was established in 1968 St. Vincent had 450 families, with 197 of them coming from Our Lady of Good Counsel in Southampton and the balance from St. Cyril of Jerusalem in Jamison and St. Bede in Holland, both of which were only three years old themselves. Over its 50 years St. Vincent has had only two pastors: Father William McBride, who led the parish for the first quarter-century and now Father Joseph McLaughlin, who is approaching his 25th year as pastor. Under his administration a smaller daily chapel has been added to the campus. It is dedicated to St. Louise de Marillac, who was the co-founder of the Daughters of Charity along with St. Vincent de Paul. 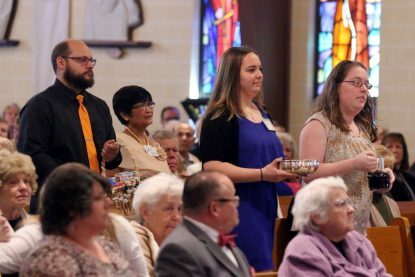 Representatives from various St. Vincent de Paul Parish ministries bring up the offertory gifts at Mass. After steady growth for most of its history, for the past five years or so it has been fairly stable with nearly 2,000 families, Father McLaughlin estimates. Edie Krieg is one of the few remaining founding parishioners at St. Vincent. 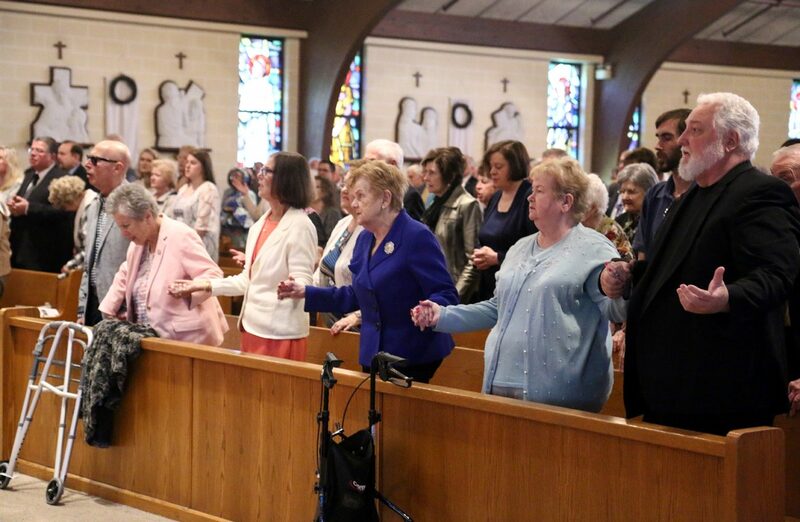 She and her late husband were previously members of Our Lady of Good Counsel and she well remembers the early Masses at Churchville Elementary School until the church was ready for occupancy in 1970. Because the parish never had a school of its own the children attended neighboring parish schools or the Council Rock School District. While Father McBride deserves much credit for establishing the parish and steering it through its opening decades, Father McLaughlin is most responsible for the emphasis on outreach programs that exist today, Krieg believes. “It has been ranked 48th or 49th among 2,000 high schools in the country,” Father McLaughlin said. Other notable outreach programs have been to Tezpur, India, but not all have been to foreign countries. St. Vincent in Richboro also partners with St. Vincent in Germantown, one of the poorest sections of Philadelphia. “We try to make a difference, although we can’t throw money at everything,” Father McLaughlin said. Not all outreach at St. Vincent’s is beyond its parochial borders. There are ample examples of outreach and fellowship within the parish that represent the universality of the church itself. Nowhere is this clearer than the annual ethic dinner (this year on May 6, which features an alphabet of cuisines — American, French, Croatian, German, Greek, Hungarian, Igbo, Indian, Irish, Italian, Japanese, Peruvian, Philippine, Polish, Spanish and Vietnamese. Norma Yabut, one of the dinner organizers, is herself a Filipina. She is also a parish ambassador with Catholic Relief Services, and proceeds from the dinner this year will benefit the CRS Helping Hands program. The universality of St. Vincent de Paul Parish was also exemplified at the anniversary Mass. Joining Archbishop Chaput and area clergy was another concelebrant, Bishop Gabriel Kumordji of Keta-Akatsi, Ghana. That is the home diocese of Father Linus Nangwele, who is the parochial vicar at St. Vincent. Music was supplemented by a Ghanaian choir. 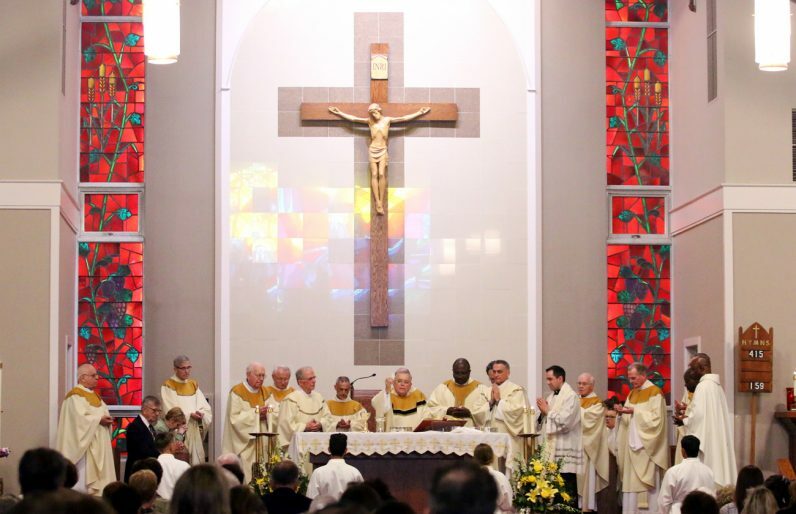 Archbishop Charles Chaput celebrates the anniversary Mass along with St. Vincent de Paul’s pastor, Father Joseph J. McLaughlin, and other clergy.